For the first time in decades, the Legislature failed to pass a biennial capital budget in 2017 after Republicans tied it to an unrelated issue of water rights. But after less than two weeks of Democrats’ control of both the House and Senate, lawmakers were able to move the vital budget forward. And they were able to negotiate the Hirst water rights issue that stalemated the last session. Rep. Gerry Pollet (D-Seattle) and Rep. Javier Valdez (D-Seattle) lauded the much-delayed passage of the capital budget today in Olympia. “Our children’s education and health along with the environment in the 46th District will benefit for many years to come from our finally being able to pass a state capital budget today,” said Rep. Pollet. Thursday evening, the House of Representatives passed the $4.18 billion-investment capital budget on a 95-1 vote. “I’m glad we have come together to create jobs, get projects started, and make our district an even more prosperous place to live,” said Rep. Valdez. The 46th District Delegation, which includes Senator Frockt who now chairs the capital budget process for the Senate, has worked for the past two years to ensure that the capital budget would include a major investment in school funding to reduce overcrowded schools in the 46th and throughout Seattle. 32nd District - portions of the cities of Edmonds, Lynnwood, Mountlake Terrace, North Seattle, all of Shoreline and Woodway, and certain unincorporated areas in Snohomish County. In the 32nd district, Sen. Maralyn Chase, D-Edmonds, jointed senators from both sides of the aisle in passing the measure. 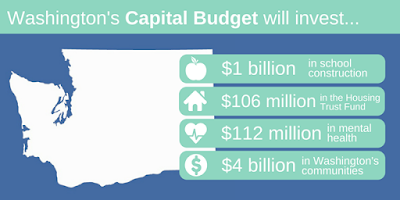 The budget will fund the largest-ever investment in K-12 school construction — about $1 billion. About $861 million will go to higher education projects. About $106 million will go to the Housing Trust Fund, the second highest such investment in state history. More than $65 million will go to community mental health beds, and about $20 million will go to both Eastern and Western state hospitals for patient safety enhancements and renovations. About $15 million in the capital budget will fund a dramatic expansion in dental care, benefitting people who previously couldn’t afford treatment. In Edmonds, the Edmonds Waterfront Center project will receive about $2 million. Updated 1-19-18 specifying Shoreline Community College as recipient of funds.